Matrix Reloaded and Goedel's Theorem, Ralph Fucetola on the Incompleteness of VR (05/16/03). Wed. August 27, 2003 at the Crystal Dragon Circle. Never again in your (or my) current lifetime will the Red Planet be so spectacular! Earth is catching up with Mars, an encounter that will culminate in the closest approach between the two planets in recorded history. The next time Mars may come this close is in 2287. Due to the way Jupiter's gravity tugs on Mars and perturbs its orbit, astronomers can only be certain that Mars has not come this close to Earth in the last 5,000 years but it may be as long as 60,000 years. The encounter will culminate on August 27th when Mars comes to within 34,649,589 miles and will be (next to the moon) the brightest object in the night sky. It will attain a magnitude of -2.9 and will appear 25.11 arc seconds wide. At a modest 75-power magnification Mars will look as large as the full moon to he naked eye. Mars will be easy to spot. At the beginning of August Mars will rise in the east at 10 p.m. and reach its azimuth at about 3 a.m. But by the end of August when the two planets are closest, Mars will rise at nightfall and reach its highest point in the sky at 12:30 a.m. That's pretty convenient when it comes to seeing something that no human has seen in recorded history. So, mark your calendar at the beginning of August to see Mars grow progressively brighter and brighter throughout the month. Share this! No one alive today will ever see this again. "Dr. Stephen Greer of The Disclosure Project, appearing on George Noory's Coast to Coast AM radio show, made an astounding announcement last night of a new "Zero-Point" free energy device which could eventually transform human life on earth. Greer had just recently returned from meetings with the inventor where he witnessed the device in operation and was clearly excited about the developments. The device works by tapping into the so-called "Zero-point" energy (longitudinal EM waves) of the quantum vacuum of "empty" space. It becomes the second device now being rushed toward full scale production, following the Motionless Electromagnetic Generator (MEG) of scientist Tom Bearden, et. al. And in fact the projected timeline to full production is about the same as for the MEG, about two years from now. So the year 2005 may well be a breakthrough year for the human race. "Greer described the device as being about 10-20 pounds in weight, and small enough that you could pick it up in one hand. It was transparently made so that all the parts and details could be fully viewed and contained no source of power such as batteries. He said it was taken out of the lab onto the sidewalk and just sat there, powering a number of light bulbs as well as a stereo system. "Greer's organization, Space Access Energy Systems (SEAS) had been running a contest called "The Z Competition" in search of the best free energy invention which could directly output usable 60 cycle 110 volt electricity (see www.seaspower.com) from the zero-point scalar energy of the vacuum. He said they had looked at a number of devices which could tap the scalar energy, but not in a way that produced immediately usable ordinary electricity. However the new device does just that. The as yet unnamed inventor had been working for 7 years on the design, and was described as being a self-taught genius who had been working on electrical devices since the age of 10. "SEAS hopes to have a scaled-up model built within about 2 months (independently replicated and tested) and then production of the devices for sale within 2 years. *** The ways in which this new device, or Bearden's MEG, will transform life on earth are mind-boggling. "For one thing, mankind can stop polluting and destroying the biosphere through the burning of fossil fuels. Cars will burn no gas or anything. Greer envisioned a two-step process for the conversion of cars to a non-polluting status. In the first phase existing cars can use the energy from the device to separate hydrogen from water and burn the non-polluting hydrogen in their existing engines. In the second phase the engines will be replaced with electrical motors and run on the free electricity itself. He mentioned also that the free energy will make possible the full "scrubbing" of other sources of pollution (the "smokestack industries") which is not economically feasible at this point. "The boon of free energy will allow people to live anywhere in the world and have their own light, heat, and electric power. It will especially impact third world nations where the cost of power is a prime impediment to development of industry. And it will make the coming "oil wars" completely anachronistic and unnecessary. ***"
the 5/4 US Supreme Court decision upholding commercial Free Speech, http://www.lifespirit.org/thompwest.html. Yes, happiness is just what we need at this time, the end of this Year One of the New Age, the year when the changes and challenges have truly begun. We are now entering the time for which many of us chose to reincarnate: there will be great changes on this world, and whether we experience the changes as an opening to the Light or as a descent into new world order darkness will depend entirely on us. There is nothing left to do but ride out the storm and come through to the other side... whole and prepared for the new world we choose to experience. LifeSpirit Center continues to grow to meet the challenges of the coming times. For example, by the middle of this past year, our main web site was getting nearly a hundred visitors most days of the month. By the last two months of this year, every day sees hundreds of visitors. We are reaching more people and receiving more feedback, convincing us that we are on the right track, metaphysically and with our energy work. Some of that work can be seen through the Institute for Health Research site, www.inhere.org and the Sound Health Research Institute site, www.lifespirit.org/shri1.html. At this time of year, people often consider how they can help. Many make donations to their favorite charities. We hope you will consider LifeSpirit among those. You can donate to LifeSpirit over the internet, by charge or debit card or electronic check, through Pay Pal. Just visit, donations.html. Any offering you can make will be appreciated. Our hearts go out to all those who have lost loved ones in the terrible attacks in New York and Washington on 9/11. We want to especially remember the decent, civilized brokers and other workers at the Twin Towers with whom we were acquainted. Please remember all the victims of these indecent and uncivilized acts in your prayers. Our deepest gratitude to all those who have reached out in this time of such suffering. Many people doing so many things to help. The extraordinary bravery of the rescue workers, firefighters and police has been so very moving. The Institute for Health Research 9/11 Aftermath & BioTerrorism Message Board for related health issues. And tears as Towers tumble. The LifeSpirit Congregational Church absolutely opposes the use of mass or group suicide as a solution to any spiritual or earthly situations, including religious, social, economic, political, personal or legal problems. We do recognize the religious right of each individual to determine the time and means of that person's own passing, if that individual voluntarily and knowingly so chooses. If any mass or group deaths were to occur involving church communicants, such deaths would not be suicides sanctioned by this Church, and any attempt by the media or civil authorities to denote such deaths as "suicide" would be highly suspect. The Church encourages the publication of declarations similar to this by all religious organizations. Given on the 11th Day of November, 1994, in memory of the victims of the Jonestown, Waco, Temple Solaire and similar mass deaths. LifeSpirit Church Founded Twenty Years Ago! It has been twenty years since we founded the LifeSpirit Congregational Church, in August of 1974. We have all learned much and experienced many changes since that time. The Church started as a circle of twenty-something's who all knew each other from college and activities, and who had spent many nights at private symposia organized to explore the questions of why the religions of our parents did not satisfy us and where we were going. Where we were going was into the New Aquarian Age. And, while we were exploring new steps in consciousness, we also learned that we were part of an historic resurfacing of the Underground Stream of Esoteric Religion which had been suppressed in the Western World during the former Piscean Age. The Great Cycle has turned, and the Great Mother has inspired us all to seek new beginnings and old, hidden knowledge. One thing we learned was that the history of consciousness on this planet was far older than the stunted beliefs of patriarchal religion. The Return of the Goddess led to an understanding that the roots of our civilization reach back far before Rome and Egypt, and even China, into the nearly mythic times of Mu and Atlantis. To the time when ancient alien "deities" walked among human kind, mixing their genetics with our primate ancestors. So we learned to explore mind and spirit. Today, the most active local congregations of the Church are engaged in spiritual ministration; in working with levels of spiritual energies which are just beginning to open to our species. For the Founders of the Church, the LifeSpirit Center is the non-sectarian outreach of that ministry, through which we perform our Spiritual Energy Work, which includes such modalities as Signature Sound and Tesla Energetics. Other Ministers of the Church are exploring other holistic paths. Among these are Holistic Synergy, developed by Rev. Caroline Bayard of the Northeast Holistic Center. 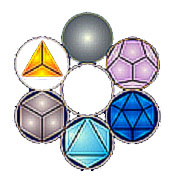 Others of our Ministers work with Sacred Geometry, Reiki, Spiritual Response, Avatar, Gems of Excellence, Homeopathy, and other advanced vibrational techniques. Many are the Paths; Oneness is their End. The forms of Spiritual Energy Work which LifeSpirit Center and the other local congregations and ministers perform, are spiritual energy research modalities and are not offered to diagnose or cure disease conditions. Anyone who suspects a medical condition should consult a medical practitioner. Spiritual Energy acts by Natural Law, bringing the energetic, emotional and physical bodies to a state of harmonic wholeness. Our Twenty Year Path has led us to seek harmony and illumination. What will the next twenty years bring? The God/Goddess within knows! So Jupiter is in for a heavenly visitation. Sometime between July 16th and July 23rd, at least 21 mountain-sized chunks of a dying comet, travelling at 37 miles per second, will smash into Jupiter creating an amount of energy similar to that which, scientists say, killed off the dinosaurs here on earth. Some scientists say that the amount of energy released will be as much as if all the nuclear arms on earth exploded at once. Fortunately, this is happening on Jupiter, not Earth, and the establishment scientists claim it will "most likely not affect us." Unfortunately, there are others who disagree. Prophet Gordon Michael Scallion says to expect "violent weather 24 hours later in the Atlantic and Pacific Oceans" (May, '94 Earth Changes Report). Scallion does see into the 21st century, and Cayce saw life in the 22nd, but it was life that had survived a 20th century cataclysm. Anyone for avoiding the beach this summer?! Updates: See, LifeSpirit Solar Storms Page. For those who have not yet heard, a few days after vibrational healer Ann Johnson left New Jersey, LSC Minister, Dot Knight discovered a 'Cross of Light' in her garage (Dot and Ann attribute the cross to a clearing she had by Ann). The Cross is large and very brilliant and beautiful, and now, other, smaller crosses are taking shape! At this writing, Ralph is putting together a pool in the garden, outside. ("What?! Pay them to put this thing up! That's crazy!) He started building the pool on Sunday morning. It is now Thursday evening. We can pretty definitely say that the pool will be ready for use by the Solstice (but don't hold us to it!) Those interested--bring towels!! Though very small, the pool, with its Rose Quartz Energy, should be refreshing. Because so many people enjoyed Chelsea Flor's lecture on Sacred Geometry at the Spring Equinox Festival, she will be presenting a series of in depth classes this summer, at MW's home in Short Hills. Call for information. Our speaker at the Summer Solstice Festival is Karina Crosta. Carina teaches 'Circles of Life', a brain/mind empowerment entrainment program developed by Dorothy Wood Espiau, which teaches people how to reprogram their body/mind computer to change their lives! This one promises to be fun! Kathy just finished her first class with Sharry Edwards of (Athens, Ohio), and is very excited about her work. Sharry has spent most of the last 20 years studying the "frequencies" of which we are all made. She has developed ways to restore "missing frequencies" to people with miraculous results! Kathy will be attending further classes with her, and hopes to be Certified to do her work by autumn. Sometime in September we plan to bring her to NJ for a 4 day "Forum I" (first of her training classes). Anyone who is interested in this work or who would like to see videos on Sharry, please contact Kathy. "You are what you eat." is a New Age cliché and truism. Even more so, you are the water you drink. About eighty percent of your bodily substance is water. Water is the matrix within which the chemical changes of our metabolism are implemented. And the waters of our bodies, like all liquids, are sensitive to vibrations of many types. Water literally holds the patterns of the vibrations it receives. Water may be "imprinted" in many ways; and once imprinted, carries the information of the imprint into the body in which it flows. One example of the imprint process is the making of homeopathic remedies. A "Mother Tincture" --typically extracted from an entire plant-- is dissolved in pure water. For a typical 12C potency, one drop of tincture is mixed with 100 drops of water, then one drop of that mixture is mixed with another 100 drops of water, and this process is repeated (with a step of shaking in between) 12 times. By the 12th dilution, there is, mathematically, not one molecule of the tincture remaining in the water. The remedy is pure water, yet it demonstrably carries to the body information of the remedy, and the body often responds. There are also advanced electrical and spiritual methods of imprinting water [which we use to make Rainbow Crystal Elixir]. And there are, unfortunately, natural and man-made factors which can imprint water in negative ways. Indeed, the waters of the world, which are recycled from ocean to rain to reservoir, contain an imprint of all the world's ills. And you make eight tenths of yourself from that water. We are not just concerned with tainted water -- and there is too much of that, especially in the East -- but, we are concerned about the energetic or spiritual imprint of even the purest water. What can be done with regard to the dangers of even "pure water"? One can find virgin water -- that is, water which comes from deep within the earth and has not ever participated in the rain cycle. Some experts now believe that such water exists, and some popular deep earth waters may qualify. Or, you can use certain occult [that is, not generally known] technologies to remove all imprints, or substitute beneficial imprints. Such techniques as the use of magnetic wands or certain [UV] light frequencies may be effective. Except for the magnetic wand, which seems to randomize all imprints, these technologies are closely guarded secrets. Please note, though, a magnet will not destroy toxins in water. This report on the Waters of Life is a preliminary view of some of our on-going investigation of the subject. "Yuletide Gift Exchange -Solstice Gathering attendees are invited to bring an "up to $15" Grab Bag gift, but must accompany it with a short, and hopefully mystifying, verse about its contents. Your Gift of old, but clean & usable clothing, is in keeping with ancient pagan traditions regarding the changing of the years. The Chinese, especially, would discard or give away old or broken household goods and clothes to celebrate the New Year. Clothing will be transferred to a charitable organization for distribution & must be wrapped securely in bags." Statement Regarding Terrorism and 911. The LSC 2001 Summer Solstice Gathering was held 06/23/01. Dr. Donald Supkow (www.stardustersociety.org) spoke about "free energy." Our 2001 Fall Gathering was held October 27th. MaryBeth and Mem spoke on the Language of Light and Dr. Supkow on recent energy developments. Our Winter 2001 Gathering was 12/31/01. Ralph has published a Case Note on Thompson v Western Medical Centers, a new 5/4 US Supreme Court decision upholding commercial Free Speech, http://www.lifespirit.org/thompwest.html. Our Spring 2002 Gathering was March 23, 2002 and the Summer Gathering was July 6, 2002 (With special thanks to Andrew and Robert for the fireworks display!). Fall and Winter Gathering, 2002 were combined and held on 12/31/02, with much merriment. See Current Bulletin for next Gathering date. If you need directions to the parsonage, please email us at lifespirit@usa.net and put "Directions Needed" in the subject line. You can join us via AOL Instant Messenger -- we are RalphKathyF. Let us know your IM tag, email to lifespirit@usa.net with "AOL IM" in the subject line. For directions, you can also call, 973-300-4594. We continue to upgrade and expand the LifeSpirit Organization web site, www.lifespirit.org and the LifeSpirit Center web site, www.lifespiritcenter.org. Consider www.lifespirit.org your portal to the internet, with links to links to links... the truth is everywhere! LifeSpiritCenter's On Line Cemetery, www.onlinecemetery.org. The sites are updated regularly. If you are not on our email list, please let us know at lifespirit@usa.net, putting "add to email list" in the subject line. Back to LifeSpirit Bulletin Current Page.